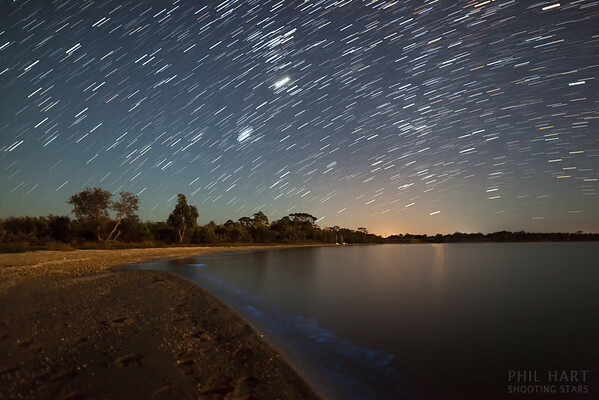 It's been four years since my first amazing photographic experience with bioluminescence in the Gippsland Lakes, but it has finally made another appearance. These images were taken between the 11th and 16th January 2013, while I was again a Program Director for Camp Cooinda, a voluntary organisation running summer camps for teenagers down at the Lakes. While this bioluminescence was generally not as bright as in early 2009, I had a better camera (Canon 5D Mark II) and a wickedly fast Canon 24mm f1.4 lens, which makes it possible to turn even modest bioluminescence into some nice photos. 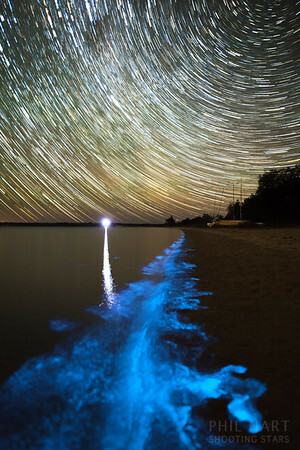 The micro-organism that causes the blue luminescence is called 'Noctiluca Scintillans', which is technically a dinoflagellate rather than a type of algae. 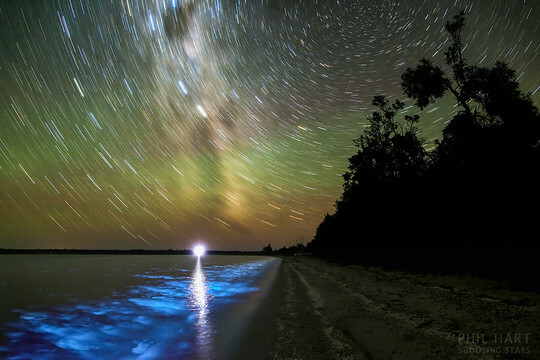 When the water is disturbed it gives off light, so each time a little wave lapped at the beach, parts of it would glow with bioluminescence. For most of these images I have stacked a 20-100 short exposures together, so that the bioluminescence adds together from each frame. 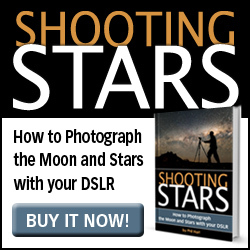 This is also causes the stars in the sky to trail as though it were one long exposure of 10-20 minutes. The last image at the bottom is one of the brightest of the individual frames. All of these pictures are taken on the shores of Lake Victoria, in the middle of the Gippsland Lakes. While it was generally fairly faint to the naked eye and therefore not colourful, there was one night where we went paddling in some canoes and found some very bright patches. At its best, we could see the brilliant, electric blue colour with our own eyes so rest assured the colour in these photos is not fake! How long does this phenonom last? Would it still be visible now (29th Jan 2013) ? Yes it is still going, but varies in strength from day to day and a little tricky to find locations where it is bright. Try Boxes Creek and Chinamans Creek near Metung. Still going, seen a lot of it on mosquito point at Metung. Been around the last few days and exceptionally bright tonight! Brightest I've ever seen in my 25 yrs at Metung. Thanks for the update Pete! Thanks for the update Pete! Keep them coming. Perhaps it will still be going for the Marlay Point race when I will be back down at the Lakes. hey, just wondering if it still glows till this day? Myself and co were down there frequently in the 2009 summer and it was magnificent. On telling people about it they assumed I was hallucinating and one friend was even in denial when I took him out wading in its glory. He refused to accept the natural magic and fobbed it off on star reflections until he could no longer resist. I found wading through it and watching the momentary lighting up to be joyous and almost esoteric. I think there should be a cult of water wading worshippers of this fascinating phenomenon that make good old Marlay point extraordinary. Can these dinoflagellates be bred in backyard swim ponds or do they require a certain level of salt? What about tank lamps? 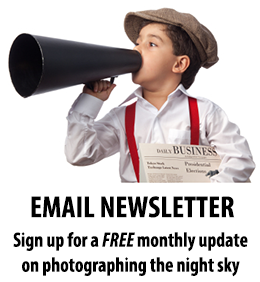 Congratulations for the APOD Phil for one of the above images! 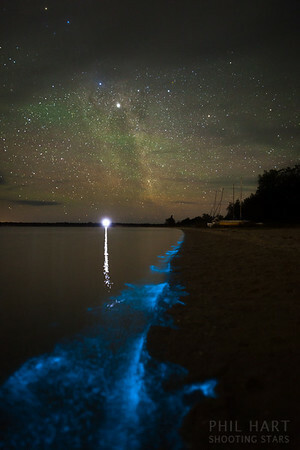 My friends and I are so impressed by the photos that you took about the blue bioluminescence. We would like to go there but it sounds like this phenomenon is seasonal. Can we see it this season? When is the best time to see it? 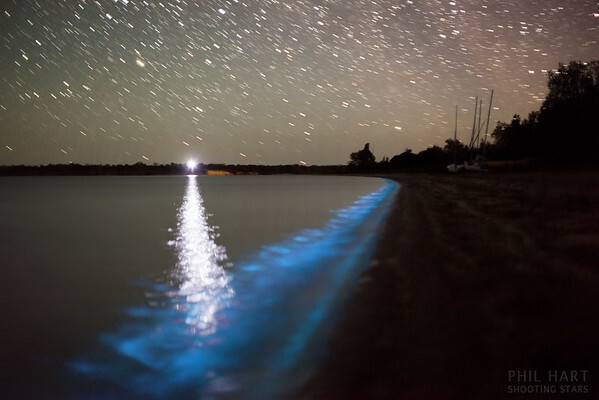 The bioluminescence only occurs in summer when the water is warm, but not every summer, and it is very difficult to predict when it will be visible. I have been to the Gippsland Lakes almost every summer for 20 years and only seen it this strong twice. So you will need a lot of luck!